The photographs below, and an accompanying pdf instruction sheet, were sent to me by Doug McKee. Doug tells me that the 1938 BJPA refers to an update to "the well known Selo Lighting Set" and says "it is now available in a new and much improved form". The instructions for Doug's Selo Lighting Set are dated 1937 and therefore the item illustrated in the main photographs below, is believed to be the version of the Lighting Set referred to in the 1938 BJPA. To download the 1937 instruction sheet, click here. The original Lighting Set is mentioned in an Ilford front cover advert in Amateur Photography magazine dated November 1935, and Doug has found a a description and image in the 1936 BJPA p.292 - see below. "an entirely new and patented invention. It is made of anodised aluminium and has a brilliant surface to reflect the maximum amount of the light given by the Photoflood lamp included with the set." Alongside (above right) can be seen an Ilford 1938 advert (back inside cover of the Ilford booklet "Winter and Night Photography, Indoors and Out") for the "the new improved Selo Lighting Set", price 10 shillings (50p). 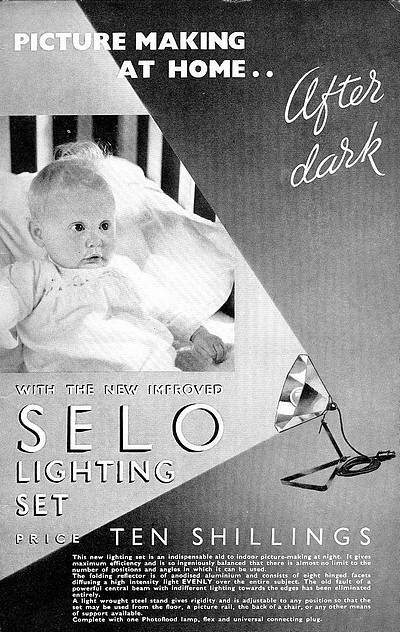 By December 1949 (see AP back cover advert, alongside, right) the Selo Lighting Set has become named the "Pack Flat Lighting Set" and is priced considerably higher than 10 years previous; it is now 22s/6d (£1.12½p). The image alongside (lower right) shows these two lighting units as they appear in the Ilford 1953 brochure entitled "Photographic Materials and Accessories for Amateur Photography", on page 22. The illustrated 1953 Pack Flat version seems to have a modified base triangle compared to Doug's Pack Flat Lighting Set (see lowest picture, below). Doug says that components in his two sets are identical but the Selo (1937) lamp is finished in smooth black while the Ilford unit is in a brown crackle finish. The Pack Flat Lighting Set seems to have disappeared shortly after 1953, because subsequent brochures don't show it (only the Junior Flood Lighting Unit). Indeed, it seems Ilford was phasing out the Pack Flat unit even before 1953, because Ilford advertisements in AP magazine during 1951 that mention table-top lighting units, refer only to the Junior Flood. 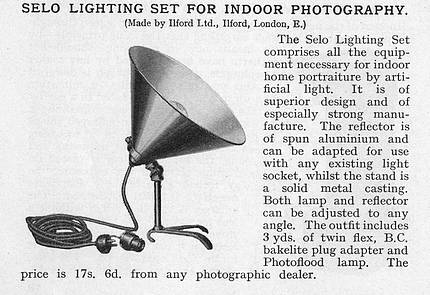 Interestingly, the Selo Lighting Set, which started in 1937-38 priced at 10 shillings and which rose (now as the Ilford Pack Flat) to 22/6d in December 1949, is reduced again considerably in the 1953 brochure, to 11s/6d. Doug's Selo Lighting Set has a pencil marked price on its box of 13s/9d (69p), which creates the small mystery of why is Doug's Selo Lighting Set, with a 1937 dated instruction leaflet, priced not as 10 shillings, but as 13s/9d ? The answer may well be that the instruction leaflets printed in 1937 were still in use several years later, when the price of the Selo Lighting Set had risen from 10 shillings to 13s/9d. The box of Doug's "Ilford Pack Flat Lighting Set" bears the pencilled price of 22s/6d. Since this price is as appears in the Ilford advert in AP for December 1949, Doug's Pack Flat Lighting Set might date to that time. 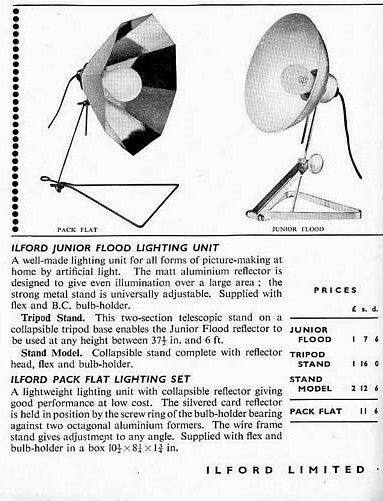 Notice that the Ilford Junior Flood is also reduced in price in 1953 compared to 1949, but not to the same extent as the Ilford Pack Flat set. The Flood has reduced from £1.12s.6d to £1.7s.6d, a reduction of 5shillings = 25p. 'Selo Lighting Set' from 1937. It 'belongs' in the lower box of the two in the picture. 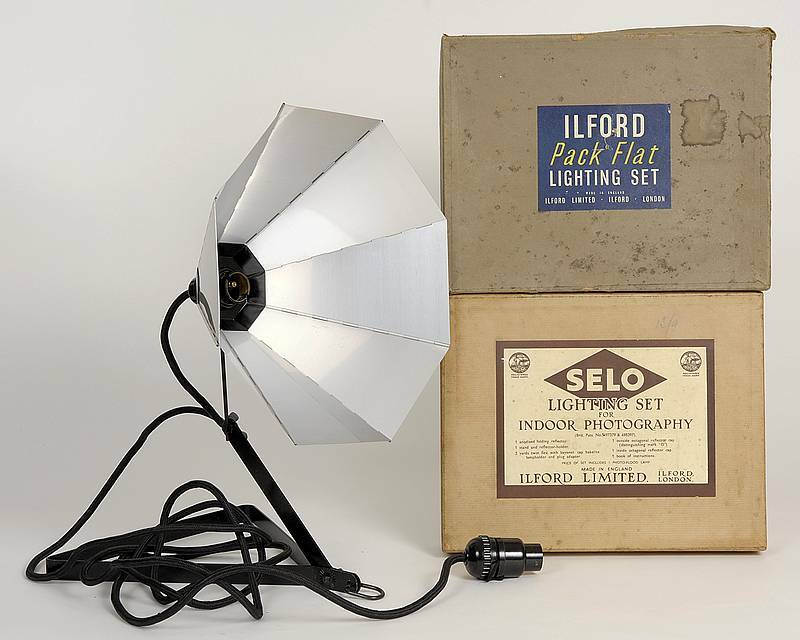 Ilford Pack Flat Lighting Set. It 'belongs' in the upper box of the two in the picture above.